Christmas at my house traditionally involves my stepfather pulling off a giant turkey dinner for the family; it wouldn’t be Christmas without bacon roasted on the turkey and sausage in the stuffing. This was the first Christmas since I became flexitarian (vegan with exceptions here and there), and I wanted to make a festive vegan dish to contribute to the plant-based options on the table. I decided to make a Festive Savoury Tart with Mushroom Gravy. I got the recipe for the tart from Dreena Burton, who I follow on Facebook. She included this recipe in her cookbook called Let Them Eat Vegan. I do not own this cookbook yet, but had access to it over the summer while living with another vegan. 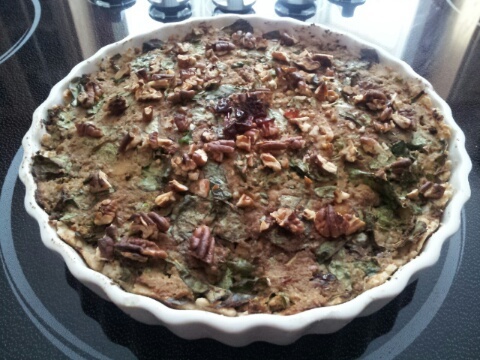 Here is my adaptation of her Festive Chickpea Tart recipe. First off, I made the pie dough. It is important to note that this recipe needs some tweaking, as it was quite difficult to roll out, and I ended up pressing it in with my fingers. While the crust stayed together when the tart was being served, I am still not convinced that this recipe is the best approach to vegan pie crust. To make the dough I tossed together the four, sugar, and salt, then cut in the coconut oil with a pastry cutter until the mixture resembled sand. I added the water little by little until the dough easily forms a ball. I think I required a little extra water to do so. I formed a ball with the dough, wrapped it in plastic wrap, flattened it into a disk, and refrigerated it for an hour. Next came the filling for the tart. I began by toasting the pecans for 8-9 minutes in an oven of 350 degrees Fahrenheit, and let them cool. Next, I sauteed the onion, celery, garlic, and salt and pepper in a pan with the coconut oil. I let them cook for about 10 minutes, until the onion was soft and golden. In a food processor, I pulsed the chickpeas (not including the reserved 1/3 cup) with the lemon juice, soy sauce, sage, and sauteed mixture, leaving the mixture slightly chunky; you do not want it to look like hummus. I added the toasted pecans and briefly pulsed it to break up the nuts. I transferred the mixture to a bowl and stirred in the spinach, cranberries, parsley, thyme, and reserved chickpeas. Then, I transferred the filling into a pie shell, with the pie dough pressed in evenly. On the top of the tart I sprinkled the topping ingredients. The pecans will toast in the oven, so there is no need to toast them beforehand. The tart was baked at 400 degrees Fahrenheit for 30 minutes. Next came the mushroom gravy. I sauteed the shallots and garlic for a few minutes, then added the sliced mushrooms and browned them for 10 minutes. I added the flour, reduced the heat, and cooked for another five minutes. Little by little I whisked in the vegetable stock and added the thyme. The gravy simmered for 30 minutes, then I seasoned it with salt and pepper. If the gravy had been too thin for my liking, I would have added more flour by mixing it with water in a little bowl, then adding it to the mixture (this reduces the likelihood of lumps in the gravy). The savoury tart was eaten by all at the Christmas meal, and I was able to enjoy the festive flavours without having any turkey. Even though this time of year has proven to be more difficult to eat vegan (with all the family get-togethers and all), it was nice to share this dish with my family. I had a real craving for your mushroom gravy. So glad I found it. Great to have easy access when out of town to my favorite mushroom gravy! Easter dinner wouldn’t be the same without it.